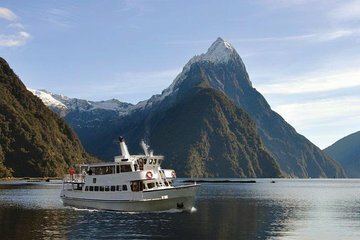 Escape the crowds on a Milford Sound cruise aboard a spacious boat with a limited number of passengers. Get up-close views of New Zealand fur seals, dolphins and Fiordland-crested penguins from the luxury lounge in the upper cabin, where you can enjoy complimentary coffee, tea and biscuits as you listen to the skipper’s narration. This boutique vessel provides a superior experience with unforgettable memories of highlights like Mitre Peak. This Milford Sound cruise uses a smaller less-crowded boat than most tours, so you can get closer to wildlife. Please feel free to bring your own food on-board the cruise.